CSB-80 - CSB Sliding Bearings India Pvt. Ltd. Operate satisfactorily without lubrication under light duty and low speed. CSB-80 has high PV capability under high temperature. High Static and dynamic load capacity. Suitable for rotating, oscillating, reciprocating and sliding movement. 1. PTFE 0.30~0.50 mm, gives high wear resistance and low friction even only minute quantities of lubricant are supplied. 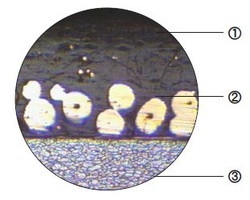 This bearing surface carries a pattern of circular indents which should be filled with grease on assembly of the bearing. 2.Bronze layer 0.20~0.35 mm, provides max. thermal conductivity away from the bearing surface, also serves as a reservoir for the PTFE/PEEK mixture. 3 . Steel-backing, provides mechanical strength and high load carrying capacity. 4 . 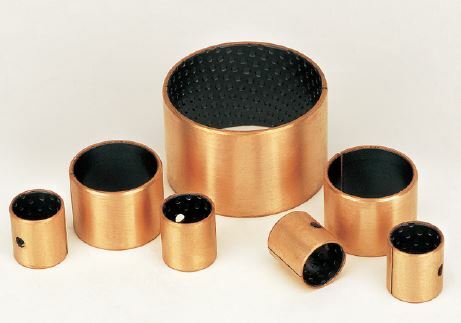 Copper/Tin plating 0.002 mm, provides good corrosion resistance. CSB-80 is supplied by customer order, the tolerance is according to CSB-20 standard dimension.